Explore machines that move objects in On the Go! This gallery is full of opportunities for problem solving, make-believe, and motion. Send your package on a circular path of conveyor belts from the big blue truck to the overhead warehouse and onto the airplane. 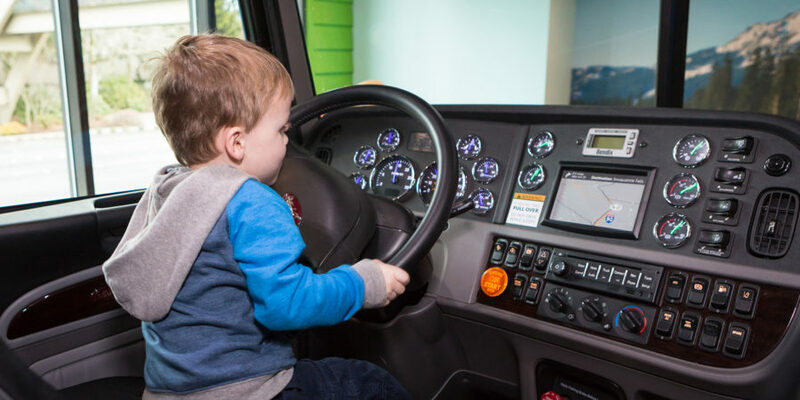 Drive the truck and perfect your paper airplane design. This is a dynamic place to explore, engineer, pretend and connect. Fold, test, and experiment with flight paths by throwing paper airplanes or using the motorized paper airplane launcher! 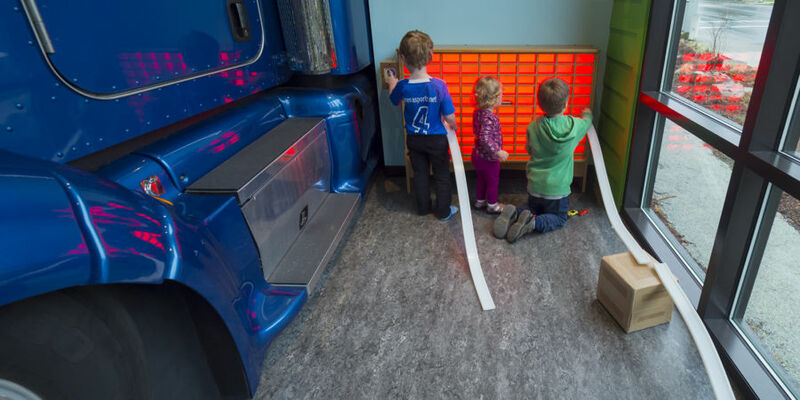 This exhibit makes for some serious fun for visitors of all ages as cause and effect and aerodynamics are explored. The new and amazing big blue truck is a 2011 Peterbilt 386 and has a home in the On the Go Gallery. Wave to the people inside the Museum and out of the window as you cruise off on an adventure. The Colorful Car Collection Case combines a hands-on interactive exhibit with a true museum collection. Kids become curators by selecting and arranging a wide array of modern and classic miniature cars in a display case. The backlighting color and intensity of the case can be changed on the control panel with the touch of a finger to illuminate favorite car color choices and enhance the display. This exhibit highlights sorting, math, color theory, sharing, and physics. As much as all of the cars in this collection have beautiful form, they also function and can be tested on custom track assemblies where kids and grown ups alike are thrilled by their own creative track building challenges. Move boxes up and across the On the Go Gallery! 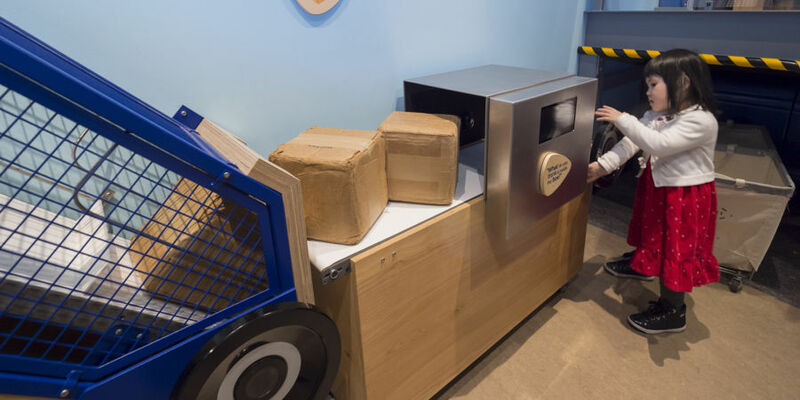 Weigh and then transfer boxes across the room using hand cranked vertical and horizontal conveyors, then collect and deliver the boxes to various play places.